New Weston resident Norman “Rocky” Bernard was 22 years old when drafted by the U.S. Army. He spent 13 months as a combat engineer in the Korean War. NEW WESTON — Of the more than 36,000 Americans who died during the Korean War, three are known to have hailed from Darke County. Army Sergeant First Class James R. Nicodemus, 31, was killed in action July 16, 1950. He is buried in Greenlawn Cemetery in Versailles. Army Private Robert W. O’Brien, 23, killed in action April 25, 1951, is buried in Greenville’s Union Cemetery. Thomas Pitman, county veterans service officer at the Darke County Veterans Services Office, said that an estimated 250 to 300 Darke County residents served in the military during the Korean War, a figure he bases upon the number of veterans and veterans’ widows who have applied for benefits from his office. Though frequently overlooked during the passage of time, the Korean War has not been completely forgotten. In many small communities and in large locales, passersby who search diligently will find reminders dedicated to those who served in the conflict. Nationally, the Korean War Veterans Memorial was dedicated in 1995 in Washington, D.C., joining the nearby Vietnam Veterans Memorial constructed a decade earlier. One of those “sons” is Norman “Rocky” Bernard. Bernard, 84, spent 13 months in Korea, serving as a corporal in the Army’s 11th Combat Engineers. He joined his unit in Korea July 20, 1952, and left for home in August 1953 — one month after the signing of the armistice between the warring parties. Sitting at the kitchen table of his New Weston home, Bernard shared his still-vivid memories of his time in Korea. Bernard was born in St. Henry, Ohio, in 1950, receiving his “Rocky” nickname from childhood friends. A graduate of St. Henry High School, he received his Army draft notice in January 1952. Following basic training and engineer’s school, Bernard spent four weeks on a ship, departing from a port in Seattle, first making landfall in Japan, then on to Pusan on the southern peninsula of Korea. As an engineer, Bernard participated in a number of tasks, including the construction of roads and bridges and clearing minefields. “We did everything needed to keep the war going,” he said. For most of his time in Korea, his unit was stationed near Kumhwa, a village northeast of Seoul, and part of what was called the “Iron Triangle” — a vital stronghold for opposing Chinese and North Korean forces. While in Korea, Bernard struck up a friendship with fellow unit member Jim Losey of Lima, Ohio. The two have been close friends ever since. Bernard said Losey is the last surviving friend from his unit. “Whenever he goes, that’s it,” he said. Upon his return, Bernard was stationed at Fort Atterbury in Indiana, then honorably discharged in October 1953. He married his wife Ruth (Fink) in 1955. He returned to his pre-war job, at New Idea in Coldwater, Ohio, for a time but then left to accept a position at the Copeland Corporation in Sidney, Ohio. Bernard worked there from 1955 until his retirement in 1993. 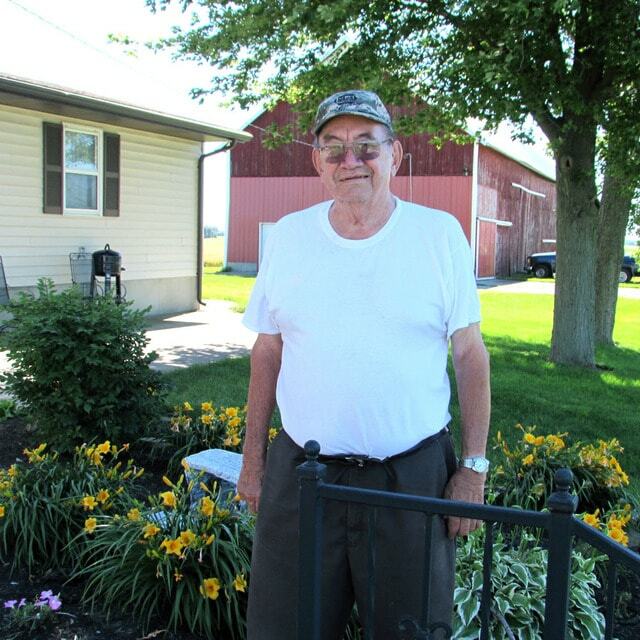 He also served as commander of American Legion Post 648 in St. Henry for two 3-year terms. His wife passed away in 2012. Together, the couple raised six children — four girls and two boys — and were blessed with 12 grandchildren and six great grandchildren. While he displays no trace of bitterness that America’s sacrifice in the Korean War has largely faded from the public’s mind, Bernard believes younger generations should learn more about the conflict and those who served there.